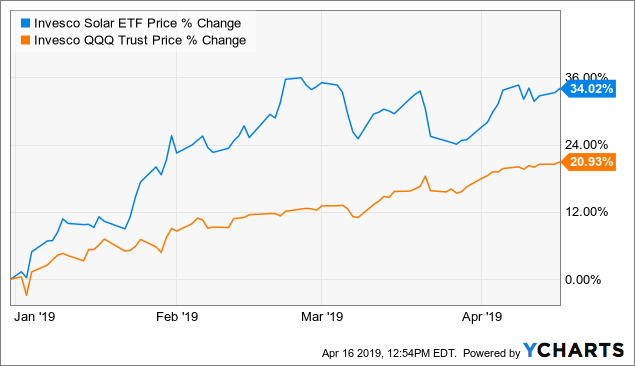 Invesco Solar ETF is up 34% YTD 2019, reversing its loss from 2018. Solar stocks are off to a strong start to the year but remain volatile trading off of the U.S-China trade dispute headlines and growth uncertainties. Global solar power demand growth is expected to remain above double digits through 2020. Invesco Solar ETF is a good option for investors to gain exposure to global trends including access to multiple foreign stocks not traded on U.S. exchanges. Invesco Solar ETF (TAN) is the largest and oldest solar specific exchange-traded fund with an inception date of April 2008 and current AUM at ~$300 million. Solar stocks suffered through 2018 with TAN falling 28% dragged lower by the poor performance of its largest holdings among the impact of negative U.S.-China trade headlines and a slowdown of solar power demand. The good news for solar investors is that optimism has returned this year. Q1 2019 has started off strongly for TAN with the ETF now up 34% YTD, outperforming broad market indexes and recovering its losses from last year. The industry remains in a high growth phase with a number of fast changing global developments driving equity returns. This article highlights key trends in solar any my view on where TAN is headed next. Solar power demand growth in 2018 slowed following two very strong years in 2016 (+34%) and 2017 (+31%). In 2018, world solar growth rose by 10% according to Bloomberg New Energy Finance (BNEF). Solar growth over the past five years (2013-18) has shown a strong compounded annual growth rate of +21%. The slowdown in 2018 was blamed on a change in Chinese subsidy policies but now compensated by accelerating growth from various other regions in the world. Solar is expected to regain strength in 2019. BNEF is forecasting that solar installs in 2019 will grow by +15%. China remains responsible for nearly 40% of global PV installs. TAN tracks the MAC Global Solar Energy Index which is also an excellent source of in-depth industry research and a promoter of solar benefits. The group publishes an occasional report that discusses developments in the industry. The main trend supporting the long-term bullish outlook for the industry is the falling cost of solar energy compared to conventional gas, coal, and nuclear. Data by an investment bank, Lazard, shows that a newly built utility-scale crystalline solar PV facility fell 13% in 2018 to a midpoint of $43 per MWh. 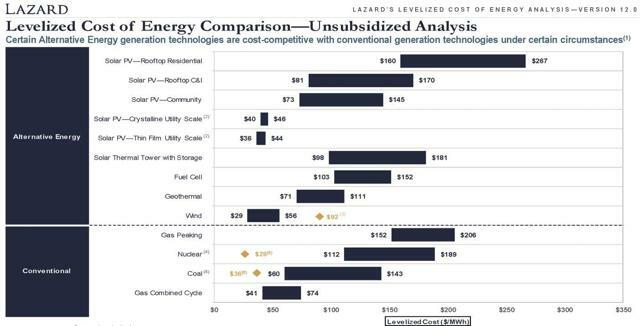 The chart below shows that solar PV now beats the cost of newly-built coal plants ($60-143/MWh), nuclear plants ($112-189/MWh), and gas-peaking plants ($152-206/MWh). The Lazard data shows that in most areas, it is no longer economical for a utility to build any new coal or nuclear plants. On the other hand, it is still relatively cheap to operate existing nuclear and coal plants with marginal costs of $28/MWh and $36/MWh. As these legacy coal and nuclear facilities reach the end of their life cycles, utilities globally will likely replace capacity with solar where the economics make sense over gas. Glut of Chinese solar modules has helped improve demand given lower prices for the hardware and the fact that solar has now reached grid parity in many areas around the world. The stabilization of solar cell and module prices since late 2018 has helped the profitability of solar manufacturers. (less uncertainty in regards to downside scenarios). Expectations for strong solar growth in Europe in 2019 as unsubsidized solar grows due to lower solar pricing and the end of Europe's minimum import price (MIP) scheme. Broadening solar growth from emerging markets particularly India and the Middle East. Strong demand for renewable energy as countries seek to meet their carbon-reduction targets under the Paris global climate agreement and country-specific clean energy mandates. Uncertainty regarding Chinese solar subsidy policy. Continued negative effect on U.S. solar from the 30% tariff on imported cells and modules that took effect in February 2018. India's government imposing tariffs on solar panel imports from China in 2018 could slow development and growth of the industry in the country. TAN is comprised of 22 holdings, including 10 companies that are not traded on U.S./Canadian exchanges. This highlights one of the best aspects of this ETF, in my opinion, in that it offers exposure to foreign stocks not easily available for trading. The ten foreign stocks together account for 39% of the ETF weighting. U.S. based First Solar Inc. (FSLR), the largest holding in TAN representing 10.25% of the fund is up 32% YTD but still down (-21%) over a one year period. The strong performance YTD compared to a still negative return over a one year period for a number of the tech sector holdings in TAN highlights the volatility of the ETF but also represents potential upside here, in my opinion. Sentiment has improved and the group is supported by long-term bullish structural fundamentals. Solar industrial Enphase Energy Inc. (ENPH) up 112% YTD has been the biggest winner in TAN this year. The company is a leader in power management and power storage solutions. The company is set to report Q1 earnings on April 30th. JinkoSolar Holding Co. (JKS) is the other stock the ETF that has already nearly doubled this year +97% YTD. The sharp drop in solar pricing observed in 2018 has had offsetting effects with winners and losers across the industry. Indeed lower costs for solar power should generally benefit developers that can bring more projects to market competitively against alternatives like wind and natural gas. My observation is that solar stocks are each unique despite the general exposure to solar across different parts of the supply chain and industry integration. Buying TAN provides diversification away from company-specific risks and allows factor exposure to the more general trends. The main question for TAN investors is if the current outperformance against the broad stock market including tech specific indexes will continue. As a macro play, the fundamentals for solar overall appear bullish long term but valuation has become more of a concern following the recent run up. A number of the companies in the group are not yet profitable or trade with large earnings premiums and otherwise stretched price to earnings ratios. As an example; First Solar Inc., TerraForm Power Inc. (TERP), and Sunrun Inc. (RUN) each have a stated P/E ratio of 41x, 78x, and 65x, respectively. Downside risks to global solar growth forecasts represent significant risks for the group. TAN investors should also be aware of the large foreign stock exposure including ADRs in consideration of FX risks. I rate TAN as a hold at the current level with positive structural trends balanced by what I view are emerging valuation concerns following the strong performance YTD.